It’s that time of year again: Sophomores are planning for study abroad. More than half of all GW undergraduates will study in a different country during their time here, and the number of students going abroad has steadily increased since 2001. Living in another country for three to nine months can have long-lasting consequences once you return – a lesson I learned the hard way. When I was in high school, I studied abroad twice. My first experience was for a few weeks in Suwa, Japan my freshman year. The second time, I decided to spend my entire junior year living with a host family in Nanjing, China. While my immersion was difficult because of language and cultural barriers, it was nothing compared to the shock I experienced when I came home. Back in the U.S., I found it difficult to relate to the people I had missed most, which left me feeling frustrated and lonely for months after I’d returned. It’s common for students coming home from abroad to experience frustration, anger, loneliness, confusion or a sense of distance from their American friends and family. Though this is only temporary, it can last up to a year after an abroad experience. Suddenly, you may feel held back by reverse culture shock during one of the most important times of college: the second half of junior year and senior year. This is the best time to build relationships with professors and make connections as you apply for internships, take on a leadership role in a student organization or start looking for a post-graduation job. When you return home, reverse culture shock can make catching up even more difficult. For many students, study abroad is a valuable part of GW’s culture. Some say it was one of the reasons they decided to enroll here, since the University has 300 programs from which to choose, in over 60 countries. And studying in a different country of course can be beneficial: You gain travel experience, and depending on your major and location, can boost your résumé to stand out in the job market. But if you’re paying tuition for an expensive, prestigious institution, you might as well attend it. It’s highly unlikely that you will receive a better education in a different country, anyway. International students come to the U.S. for a high-quality education, and it doesn’t make sense that some American students want to do the opposite. And if you do choose to study abroad, you’ll still need to pay full tuition. That doesn’t include the program fee, which can easily cost thousands of dollars. Granted, the University has tried to make studying abroad more affordable: It has created a few different scholarship opportunities for students, like the GW Blog Abroad Scholarship and the GW Commitment to Community Scholarship. 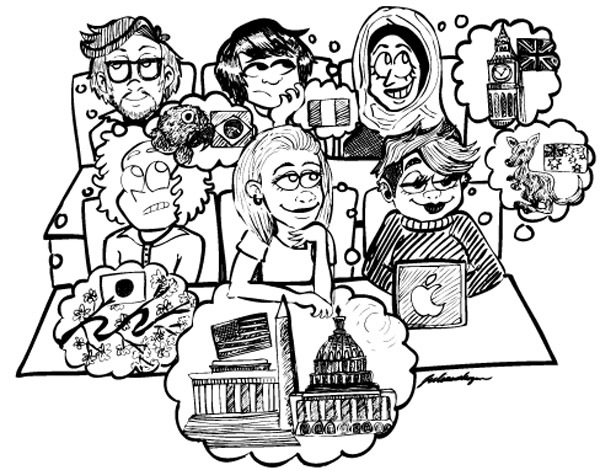 But you need all four years to fully take advantage of living in D.C. Each neighborhood – Georgetown, Adams Morgan, Friendship Heights, to name a few – offers a unique cultural experience. The District is much more than just a political city. Whether you’re looking to further your career or open your mind to other cultures and new experiences, or both, this city is the place to be. If you’re excited about studying abroad, I’m not trying to stand in your way. But for those of you on the fence who are unsure if study abroad is right for you, it’s important that you examine the drawbacks. It isn’t a bad idea for everyone, but most of us should go overseas another time. Go on vacation after you graduate, take a trip for a short-term summer program or take a class that allows you to go abroad during spring break. You could even do an Alternative Break, which organizes service trips abroad if you’re looking for a taste of a different culture. When it comes to your remaining semesters, though, stay here. Stay connected to your friends and your school for the short time you’re at GW. You won’t get another chance. Kirby Dzurny, a sophomore majoring in international affairs and creative writing, is a Hatchet opinions writer.